I needed a new iPhone case to replace my Clear Air Jacket which has cracked after more than 6 months of use. 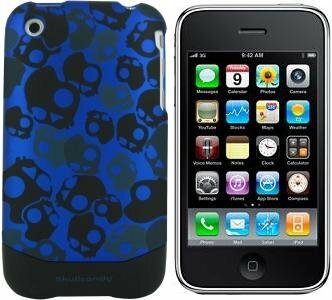 One day I came across a case that looked pretty good, a blue skull candy skull hard case, it looked like a incase slider so I thought I would pick it up and see how it is. I did and today I tried it and it wasn’t all that good. The sides extend too much onto the iPhone and it messedup my screen protector. Now my screen protector also by powersupport has a little bit where it isn’t sticking to the screen. I really don’t recommend this case if you have a screen protector on. Now if you don’t have a screen protector this might be a good case. I haven’t really used it for long but I am pretty sure that the paint will come off after long use. The case looks exactly like an incase slider except the inside protective railings and the sides. Overall I will use my new incase sider rather than this case since the iPhone 3GS has a fragile screen that will eventually wear out and needs a screen protector to protect it. Another thing about this case is that since it extends out too much and it’s on a screen protector it’s super hard to remove. It took me 15 minutes just to removed it. So if it is stuck plug your headphones into your headphone jack and push it and it should come out.